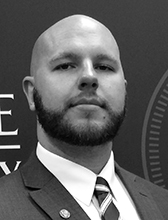 Brandon A. Sullivan (Ph.D., Criminal Justice, Michigan State University) is an Assistant Professor in the Center for Anti-Counterfeiting and Product Protection (A-CAPP) at Michigan State University. He is co-PI and Project Manager for the U.S. Extremist Crime Database (ECDB) – Financial Crimes and a Research Affiliate with START. His research examines the financial crime activities of al-Qaida and affiliated movements and far-right extremists in the United States. His dissertation is a longitudinal network analysis of financial crimes committed by far-right extremist tax protesters. His general research interests are enterprise and financial crime, including crime involving extremist, terrorist, and organized crime groups. Other research focuses on product counterfeiting, policing, corporate and white-collar crime, media and crime, and environmental crime, as well as mixed method and social network analysis.